to carry the show FREE on your station and find more promotional material. Since 1990, Pulse of the Planet has offered a FREE two-minute sound portrait of planet Earth daily to listeners all over the globe. 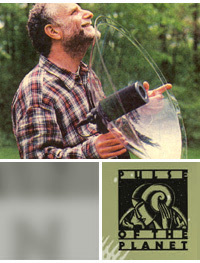 Building upon Jim Metzner's Sounds of Science, Pulse of the Planet has received numerous honors, including the Gabriel Award, the Gold Medal of the International Radio Festival, and the 2001 Media Award from The American institute of Biological Sciences. Visit Pulse of the Planet at PulsePlanet.com to hear past and present shows. Or click to the carriage list to find a station. Or click to the media resources page for additional materials about the show. Pulse of the Planet is available FREE to qualified stations for broadcast each month. Featuring five shows a week with the rights to repeat each program up to three times. With support from The National Science Foundation, the two minute daily series is distributed exclusively by Murray Street.